Ryan Giggs has revealed he told Louis van Gaal not to sell three of united stars during their time together at Old Trafford. 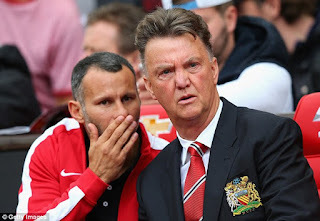 Van Gaal appointed Giggs as a first-team coach in 2014 but Giggs left the club in 2016 when the Dutchman was sacked and replaced by Jose Mourinho. Van Gaal spent £250m in just two year at the club and, though few of his signings worked out, United fans were not pleased with the players he let go as the ones he brought in. During Van Gaal's tenure, United let thee likes of Javier Hernandez, Robin van Persie, Angel Di Maria, Shinji Kagawa and Wilfried Zaha leaves. Giggs revealed he told Van Gaal not to sell three specific players. "There have been a lot who have come through that haven't been united players and also players who were United players and shouldn't have left," said Giggs, speaking to The Times. "I'm talking about Rafael, Welback, Jonny Evans - players who are United through and through." "It was hard because Louis had his own ideas and you had to respect that, but, yes, we had a few arguments about a couple of them. He understood (my position) because I had played with those lads, but they just weren't for him. "Some of them, like Welback, wanted to play more regularly, and Jonny had a few injuries at the time, so you could understand it, but - and it's not saying it in hindsight - recruitment hasn't been great either." Mourinho upon taking charge at at Old Trafford also admitted he would have kept a number of players that had been sold by the club had he arrived earlier. "I found a sad club," said Mourinho in 2016. "United sold players I would never sell, bought players that I would never buy. I would never sell Angel Di Maria, Javier Hernandez, Danny Welback. Never. No chance"